Biopharmaceutical manufacturing is complex and labor and cost intensive. Recombinant FH has been expressed in mammalian cells,31 insect cells,32 and yeast.33 However, these approaches have yet to show therapeutic value. Here, we describe the generation and production of moss-produced recombinant human factor H (FHmoss) in glyco-engineered moss strains. We proved complete glycosylation via mass spectrometry (MS) and characterized the regulatory activities of FHmoss in functional analyses, where it showed full bioactivity. Using sera of patients with aHUS, we showed the ability of FHmoss to inhibit serum AP activation as well as protect cells from disease-induced hemolysis. Additionally, in vivo administration of FHmoss increased serum C3 levels and significantly reduced glomerular C3 deposition in FH−/− mice, making it a candidate biopharmaceutical for patients suffering from complement dysregulation. In a research and development production and purification process, FHmoss was extracted from bioreactor culture and purified via a two-step chromatography protocol, and reasonable yields of FHmoss were achieved (Supplemental Table 1). The quality of purified FHmoss was analyzed by SDS-PAGE and Coomassie staining, and the purity was approximately 85% as determined by band intensity densitometry, whereas very low amounts of host cell proteins were observed (Figure 1A). SDS-PAGE and Western blot analyses confirmed the pattern shown before in our proof of concept study for full-length FHmoss production37 with two distinct bands, which were comparable with those of FHplasma and had apparent molecular masses of approximately 140 kD and 120 kD in SDS-PAGE under reducing conditions (Figure 1, A and B). To identify the nature of these two bands, we performed protein deglycosylation with PNGase F. SDS-PAGE showed that deglycosylation reduced the overall size of the bands, whereas the two distinct bands remained (Figure 1B). When we compared reduced with nonreduced protein, we observed only one band under nonreducing conditions with the size of the lower band (Figure 1C). Thus, we conclude that the lower FH band resulted from incomplete reduction under the conditions used. However, both FHmoss bands were separately subjected to MS analysis and identified with a sequence coverage of 74% for the higher band and 57% for the lower band (Supplemental Figure 1), confirming the presence of the FH N- and C-termini in both fractions. Furthermore, we detected five of eight known FH glycopeptides14 after enzymatic digest with trypsin, thermolysin, and chymotrypsin, respectively (Figure 1D, Supplemental Figures 2 and 3). FHmoss glycopeptides from the higher and lower band displayed predominantly the complex type N-glycan GnGn (Figure 1D, Table 1). Structures displaying terminal mannose on one antenna were identified in low proportions (Supplemental Figure 4). The unglycosylated version or N-glycans bearing plant-specific xylose and α1,3-linked fucose was not detected for any of the glycopeptides. The absence of these sugars from the FHmoss-producing strain and the parental line Δxt/ft was confirmed in Western blots with specific antibodies against these residues as described before42 (Supplemental Figure 5). Additionally, we found that the putative farther glycosylation site at Asn199 is not glycosylated in FHmoss as already described for native human FH.14 Instead, both forms were found to be deamidated to Asp. In summary, we confirmed completeness of FHmoss displaying a very homogenous N-glycosylation pattern devoid of potentially immunogenic sugar residues. Purified FHmoss is intact and completely N-glycosylated. 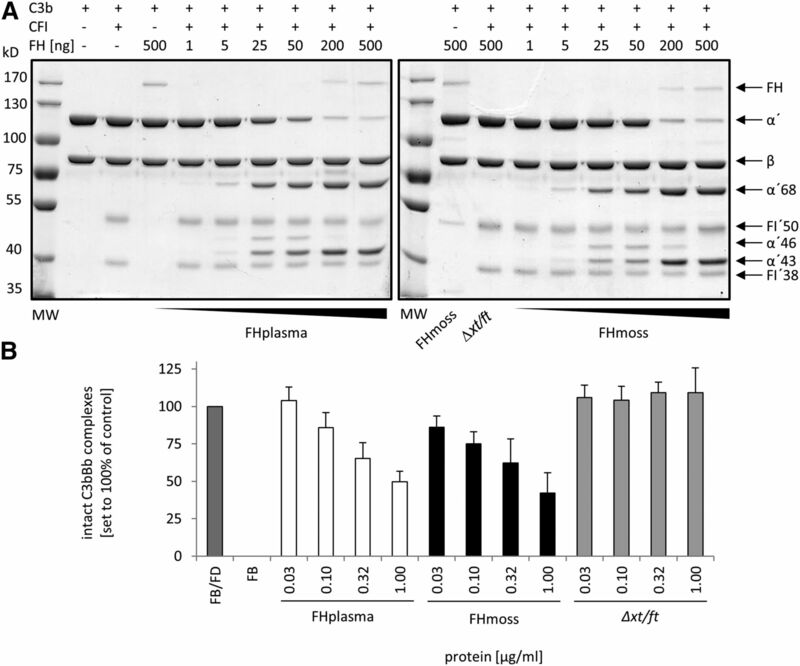 (A) Characterization of FHmoss and FHplasma. Samples were separated under reducing conditions on SDS-PAGE and Coomassie stained. (B) Deglycosylation (degly.) of FHmoss and FHplasma. Samples treated with PNGase F (arrow) and untreated controls were separated under reducing conditions on SDS-PAGE and silver stained. MW, molecular mass marker. (C) Western blot of FHmoss and FHplasma under reducing and nonreducing conditions. (D) Summed MS1 scans showing complex GnGn-glycosylated FHmoss peptides. FHmoss was tryptically digested and analyzed by nano–LC-MS/MS on a Q-TOF instrument. Among the identified peptides, the glycopeptides 850–867 (IPCSQPPQIEHGTINSSR; glycosylation site Asn864), 889–901 (ISEENETTCYMGK; glycosylation site Asn893), and 1006–1018 (MDGASNVTCINSR; glycosylation site Asn1011) are displayed. Oxidized methionine is labeled with Mox. Shown m/z values correspond to the most abundant isotope peaks for each glycopeptide. The monoisotopic masses for all glycopeptides are listed in Table 1. After proving the structural integrity of FHmoss, we aimed to analyze binding characteristics that are essential to mediate the complement regulatory activity of FH. Binding to C3b is required for FH to control C3b amplification and AP activation. Therefore, FHmoss and FHplasma were compared for their ability to bind to immobilized C3b. In the ELISA-based assay, FHmoss specifically bound to C3b, similar to FHplasma (Figure 2A). Because the protective function of FH against complement attack of host cells is mediated via polyanionic surface structures, such as heparin sulfate chains,23 heparin binding was tested. Binding values of both FH variants to immobilized heparin were at comparable levels (Figure 2B). FHmoss interacts with C3b, heparin, and host cell surfaces. (A) Relative binding of FHmoss and FHplasma to immobilized C3b measured by ELISA. (B) Relative binding of FHmoss and FHplasma to heparin measured by ELISA. Controls represent unspecific binding of FHmoss or FHplasma to BSA- or PBS-coated wells. Unspecific response of putative moss-derived contaminants was tested using a sample of the parental moss strain Δxt/ft. Data represent mean values ±SD from n=3 experiments. The values obtained for the binding of FHplasma to C3b or heparin were set to one. (C) Binding of FHmoss to the surface of HUVECs analyzed by FACS. FHmoss (red line), FHplasma (blue line), moss parental strain Δxt/ft (black line), and buffer negative control (gray shadow). (D) Binding of FHmoss to the surface of HUVECs analyzed by immunofluorescence microscopy and visualized using FH-specific antibodies and secondary Alexa 488–labeled antibodies (green; upper panel). FHmoss is colocalized with wheat germ agglutinin (Alexa 633 labeled; red), which recognizes sialic acid and N-acetylglucosamine residues predominantly found on the plasma membrane (lower panel). Nuclear staining was performed by HOECHST (blue). The purified extract of the parental moss strain Δxt/ft was included as control. Scale bar, 50 μm. Furthermore, the ability of FHmoss to bind to endothelia was analyzed by testing binding to human umbilical vein endothelial cells (HUVECs). After incubation with FHmoss, FHplasma, or controls (Δxt/ft and buffer), FH attached to the cells was analyzed by flow cytometry. 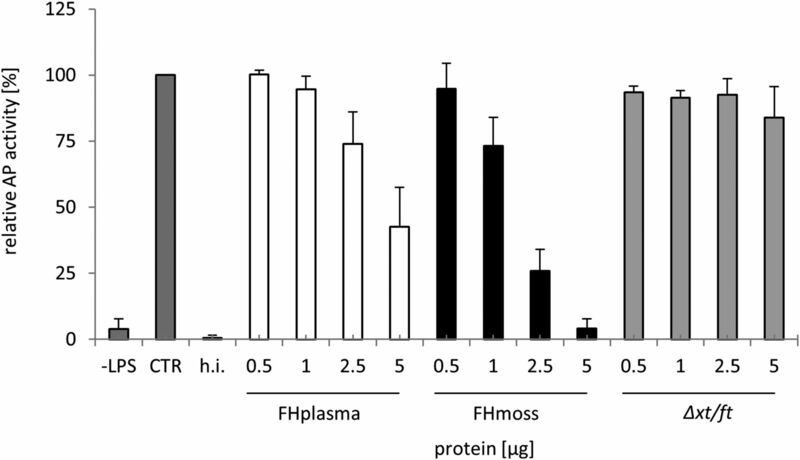 The mean fluorescence values observed were 49.02 for FHmoss and 25.78 for FHplasma, whereas binding of the Δxt/ft extract (8.28) was comparable with the buffer control (7.18), indicating that the binding capacity of FHmoss to endothelial cells is slightly enhanced to that of FHplasma (Figure 2C). Surface attachment of FHmoss to HUVECs was also visualized by immunofluorescence microscopy. Binding of FHmoss was detected with an Alexa 488–labeled antibody, resulting in green signals at the cell surface (Figure 2D, left panel). These results show that FHmoss binds to human cell surfaces. Because FH is an essential cofactor for FI-mediated proteolysis of C3b to control the AP amplification cascade, we compared FHmoss and FHplasma for their cofactor activity in a fluid-phase assay. After adding FHmoss or FHplasma to C3b and FI, we observed a concentration-dependent cleavage of the C3b α′-chain into the typical α′68-, α′46-, and α′43-kD fragments, whereas the C3b β-chain remained unaffected. Cleaved α′-chain fragments were already detectable after the addition of 1.6 nM (5 ng) FH (moss or plasma derived), showing comparable cofactor activities (Figure 3A). In addition to its cofactor activity, FH controls complement activation by dissociation of C3-convertase (C3bBb) complexes. Therefore, decay acceleration activity of both FH variants was compared in a solid phase–based ELISA. The addition of either FHmoss or FHplasma resulted in a dose-dependent dissociation of Bb from the preformed C3 convertases, showing similar decay acceleration activity for moss- and plasma-derived FH (Figure 3B). FHmoss displays cofactor and decay acceleration activity. (A) FHmoss has complement cofactor activity. 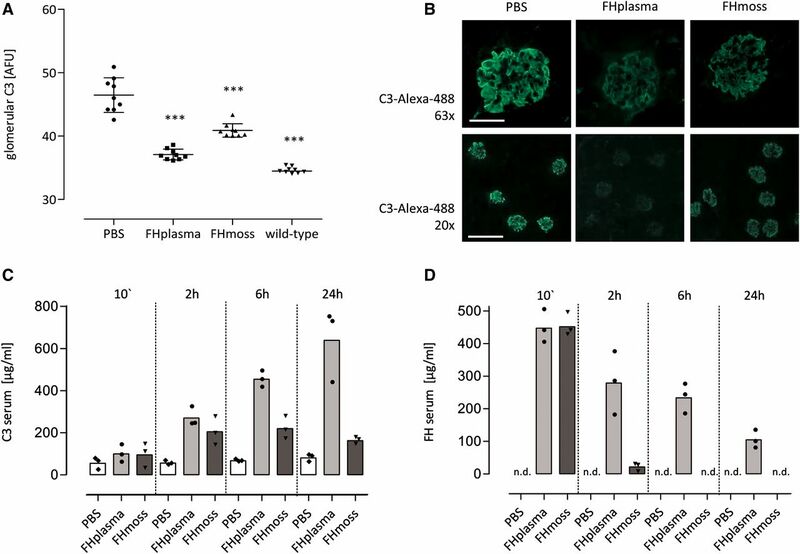 C3b (2 μg), FI (500 ng), and increasing concentrations of FHmoss or FHplasma were incubated, and C3b cleavage was visualized by SDS-PAGE and Coomassie staining. FHmoss shows similar cofactor activity compared with FHplasma as shown by a reduced intensity of the α′-chain and the appearance of the α′-chain cleavage fragments α′68, α′46, and α′43. Controls were performed without C3b, FI, or FH or with the extract of the parental moss strain Δxt/ft. (B) FHmoss efficiently promotes C3 convertase decay. FHmoss or FHplasma in indicated amounts was added to preformed C3 convertase (C3bBb) complexes (FB/factor D), and dissociation of these complexes was determined by measuring the relative amount of FB. OD at 450 nm values of control wells (without FH) were set to 100% intact C3bBb complexes. Negative control was performed without adding factor D. Data represent mean values ±SD from n=3 experiments. Therapeutic approaches in patients with aHUS aim to prevent activation of the terminal complement cascade. Therefore, we explored the potential of FHmoss to suppress C5b-9 formation in serum of patient 1 with aHUS carrying a heterozygous R1215Q mutation in FH using the Wieslab Complement System Alternative Pathway ELISA.45 Serum of this patient shows normal AP activity. However, the addition of increasing concentrations of FHmoss to serum of patient 1 inhibited formation of active C5b-9, thus showing that FHmoss inhibits the AP in patient serum after LPS-induced activation (Figure 4). AP activation in serum of a patient with aHUS is efficiently inhibited by FHmoss. FHmoss and FHplasma added to serum of patient 1 with aHUS inhibit AP activation in a dose-dependent manner. Functional activity of FHmoss was determined by measuring the inhibition of C5b-9 formation in serum using Wieslab Complement System Alternative Pathway ELISA. Undiluted serum (CTR) was set to 100% AP activity; Δxt/ft, heat-inactivated serum (h.i. ), or unstimulated serum (–LPS) were used as negative controls. Data represent mean values ±SD from n=3 experiments. Next, we assayed if FHmoss affects AP activity on host surfaces on erythrocytes.30 Sheep erythrocytes (sE), like human erythrocytes, express glycosaminoglycans on their surfaces and are normally protected from complement-mediated lysis by plasma-derived FH.30 Incubation of sE with FH-depleted serum leads to AP-mediated cell surface complement activation, C5b-9 formation, and subsequent hemolysis. The addition of FHmoss or FHplasma specifically and dose dependently protected sE from lysis caused by the hemolytic activity of FH-depleted serum (Figure 5A). As in FH-depleted serum, loss of complement regulation in sera of some patients with aHUS is reflected by increased hemolytic activity.30 Serum from patient 2 carrying a C-terminal FH deletion causes complement overactivation and lysis of sE. Again, the addition of FHmoss or FHplasma efficiently and dose dependently protected sE from complement-mediated lysis (Figure 5B), confirming that FHmoss has the ability to reverse an inherent regulatory defect if supplemented to this patient serum. FHmoss protects sE from hemolysis induced by FH-depleted serum or serum of a patient with aHUS. Lysis of sE was determined by measuring the absorbance at 414 nm of released hemoglobin. (A) FHmoss and FHplasma protect sE from lysis mediated by FH-depleted serum in a dose-dependent manner. Heat-inactivated FHmoss (FHmoss h.i.) or purified extracts of the parental moss strain Δxt/ft show no activity. (B) FHmoss also protects sE from lysis mediated by serum from patient 2 with aHUS. Data represent mean values ±SD from n=3 experiments. NHS, normal human serum used as negative control of induced hemolysis. Glomerular C3 deposition and low serum C3 levels are characteristic pathologic abnormalities in patients with C3G. FH−/− mice also develop abnormal glomerular C3 accumulation and low serum C3 levels due to AP overactivation,46 which can be revoked by human FH supplementation,29 thus providing a useful C3G model for testing therapeutic efficiency of recombinant FH. To test whether FHmoss regulates AP activation in vivo, either 0.5 mg FHmoss or 0.5 mg FHplasma was injected intravenously into FH−/− mice. As determined by glomerular C3 immunostaining, FHmoss significantly reduced C3 staining in the glomeruli after 24 hours compared with PBS-treated mice (Figure 6, A and B). We next explored the influence of FHmoss on serum C3. As determined by quantitative ELISA, serum C3 levels increased in FHmoss- (205±68 μg/ml) and FHplasma-treated animals (270±46 μg/ml) 2 hours after FH administration (PBS-treated group was 56±10 μg/ml). FHmoss-treated mice reached peak C3 values at 6 hours (220±54 μg/ml) that remained stable until 24 hours; FHplasma-treated mice reached peak C3 values after 24 hours (639±174 μg/ml) (Figure 6C). C3 level in untreated FH−/− mice was 49±0.8 μg/ml; in normal wild-type mice, it was 1275±122 μg/ml. Highest serum FH levels were detected 10 minutes after injection at comparable values (FHmoss: 452±36 μg/ml; FHplasma: 447±50 μg/ml). Thereafter, FH levels diminished in both groups but more rapidly for FHmoss (2 hours: FHmoss: 22±12 μg/ml; FHplasma: 279±96 μg/ml), indicating that FHmoss is removed faster from the fluid phase (Figure 6D). Antibodies to human FH were tested in sera of FH and PBS-treated mice, and no antibodies were detected (data not shown). FHmoss reduces glomerular C3 depositions and ameliorates serum C3 levels in FH-deficient mice. 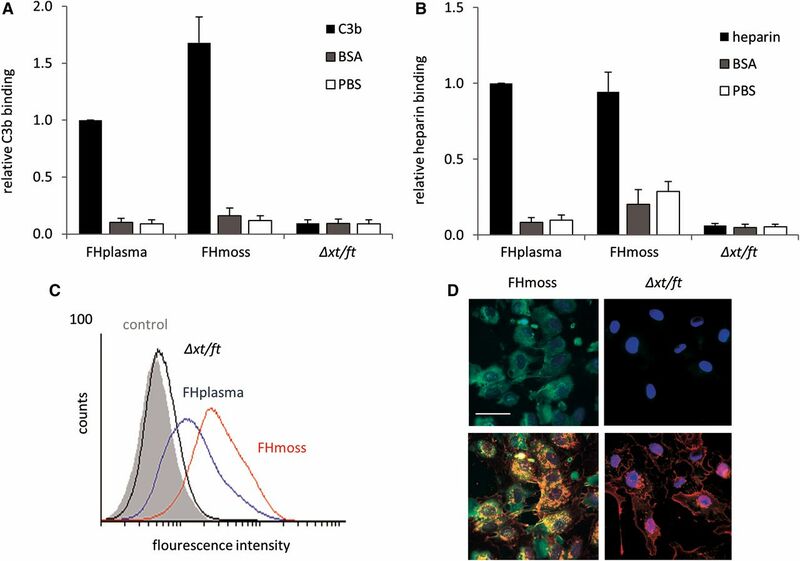 (A) Glomerular C3 intensity was significantly reduced 24 hours after administration of FHmoss or FHplasma compared with PBS-treated control mice as shown by quantitative immunofluorescence. Kidney sections of normal untreated wild-type mice were used as negative controls for C3 staining. Data are shown as bars (mean) ±SD, with plotted individual data points (mean fluorescence intensities obtained from n=3 glomeruli per section from n=3 animals per group) expressed as arbitrary fluorescence units (AFUs). ***P<0.001 versus PBS group, one-way ANOVA with Bonferroni multiple comparison test. (B) Representative images of glomerular C3 deposits in FHmoss- or FHplasma-treated mice after 24 hours. Original magnification, ×63 in upper panels; ×20 in lower panels. Scale bars, 50 μm in upper panels; 200 μm in lower panels. (C) Time-dependent increase of serum C3 levels after intravenous injection of FHmoss or FHplasma compared with PBS control mice as determined by ELISA. Data are shown as bars (mean) with plotted individual data points (n=3 animals per group). (D) FHmoss and FHplasma were detected at comparable levels 10 minutes after intravenous administration and decreased moderately in the following measurements. Levels of FH were determined by ELISA. Data are shown as bars (mean) with plotted individual data points (n=3 animals per group). n.d., Not detectable. Treatment options for the devastating diseases aHUS and C3G are limited, and therefore, new therapeutic approaches are needed. Here, we describe the production of biologically active glycosylation-optimized FHmoss in the moss P. patens. We showed full bioactivity of FHmoss and proved its ability to control complement activation in serum of patients with aHUS as well as a C3G mouse model. Therefore, the establishment of a production system for recombinant FH is highly desirable. 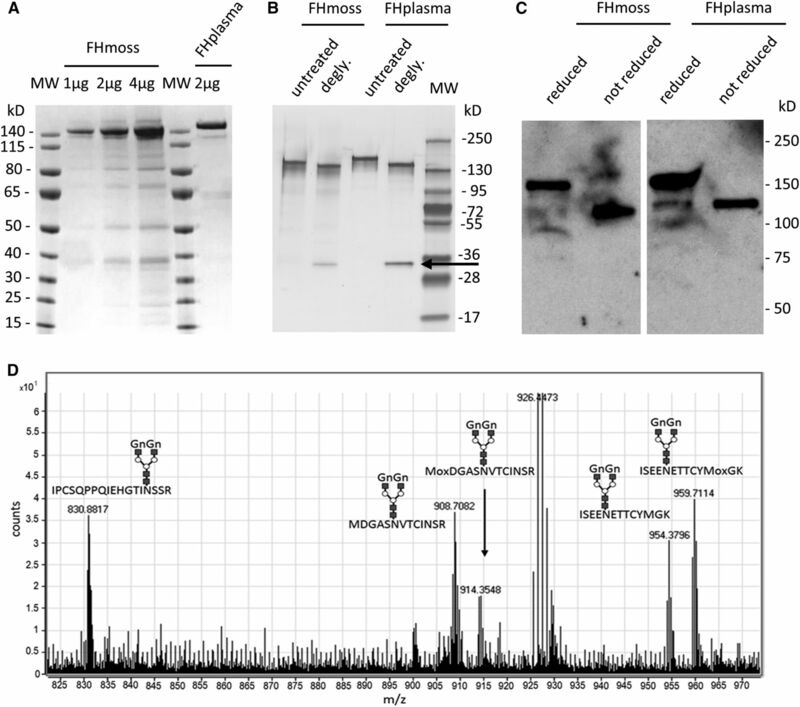 Moss is an established system for the large-scale production of pharmaceutical proteins.34,35,37,44,49 Additionally, precise genome editing via homologous recombination50–52 allows the engineering of the glycosylation pattern of moss for improved biopharmaceuticals.40–43 N-glycosylation plays an important role in protein structure, stability, and functionality.53 Moreover, differences in the glycosylation pattern compared with the native protein can not only affect the in vivo activity but also, cause immunogenicity and subsequently, a decline of product efficacy as well as clinical complications.54 As higher eukaryotes, plant cells synthesize complex proteins and perform post-translational modifications similar to human cells. Unlike insect cells and yeast, which display N-glycans with mainly paucimannosidic and high-mannose structures, respectively,55 plant cells are able to produce N-glycans of the complex type with the core sugar structure GnGn, which are identical to those in humans.56,57 Differences caused by plant-specific sugar residues have been eliminated successfully by gene targeting of the responsible glycosyltransferases.43 The FHmoss produced in this glycosylation-optimized moss line was evaluated for its N-glycosylation pattern and showed a complete elimination of plant-specific sugars. In addition to excellent in vitro activity, FHmoss induced a reduction of C3 deposition in glomeruli of the FH−/− mice and increased serum C3 levels. We observed a reduction of FHplasma and FHmoss from sera within the first 2 hours after intravenous injections, which was more pronounced for FHmoss and might be caused by endothelial surface binding. The faster removal of FHmoss from the serum might also be attributed to a lack of terminal sialic acids, which are common on mammalian glycoproteins, including human FH,14 but generally missing in plants. FHmoss N-glycans carry terminal GlcNAc residues, which are recognized by the Man/GlcNAc receptor (e.g., on macrophages) and thus, could be subjected to rapid clearance.58,59 Sialylation of plant glycoproteins was proven in transient approaches.60 Therefore, we assume that moss glyco-engineering toward terminal sialylation is feasible. In conclusion, glycosylation-optimized FHmoss binds to heparin and C3b equivalently to FHplasma as well as cell surfaces, thereby potentially protecting host cells from AP overactivation. We were able to show full AP regulation capacity, because FHmoss shows cofactor activity and in addition, accelerates the decay of C3bBb complexes as efficiently as FHplasma. Moreover, addition of FHmoss to the serum of a patient with aHUS efficiently abolished C5b-9 formation, and as shown by hemolysis assays, FHmoss protected sE from complement-mediated lysis caused by serum of a patient with aHUS. Finally, systemic application increased serum C3 levels and reduced glomerular C3 depositions in a murine C3G model. Taken together, our results show that FHmoss is completely glycosylated, is devoid of potentially immunogenic plant-specific N-glycans, and has full biologic activity in vitro and in vivo, making it a candidate biopharmaceutical with clinical potential for therapeutic interventions in patients suffering from complement dysregulations. For protein analysis, in vitro activity tests, and in vivo experiments, cultivation of FH-expressing moss lines was done as described previously37 with few modifications. The cultivation duration was 16 days. For chromatographic purification, FHmoss was extracted, concentrated, and adjusted to phosphate buffer (PB; 10 mM Na2HPO4 × 2H2O and 1.76 mM KH2PO4 [pH 7.4]) supplemented with 1 M NaCl by tangential flow filtration (30-kD cutoff; regenerated cellulose membrane) and loaded onto a PhenylSepharose 6 FF HS Column (GE Healthcare, Uppsala, Sweden) equilibrated with PBS and 1 M NaCl (pH 7.4). FHmoss was eluted with elution buffer (PB containing no additional NaCl) in a single step of five column volumes (cv) 100% B. Appropriate fractions were pooled, diluted with PB to a conductivity of ≤10 mS/cm, and loaded onto a HiTrap Heparin HP Column (GE Healthcare) equilibrated with PB supplemented with 68 mM NaCl. FHmoss was eluted using increasing amounts of elution buffer C (PB and 1 M NaCl): ten cv 10% C followed by a linear gradient of 10%–30% C in 20 cv followed by a wash with 100% C. FHmoss containing fractions was pooled and further concentrated using Vivaspin Turbo 15 (PES membrane; Sartorius, Gottingen, Germany). During concentration, buffer was adjusted to PBS. Samples from the parental moss line Δxt/ft were purified as described for FHmoss and served as control extract. ELISA was performed as described before38 using the mAb T 13 and a rabbit polyclonal antibody21 or the Complement Factor H ELISA Kit by Hycult Biotech (Uden, The Netherlands). FHmoss was detected by SDS-PAGE and Western blot using polyclonal goat antibody against human FH (Complement Technology; Tyler) and a rabbit anti-goat IgG (GE Healthcare). Deglycosylation with PNGase F (Promega Corp.) was performed following the manufacturer’s instructions. Mouse serum C3 levels were measured by C3 ELISA kit provided by ABCAM (Cambridge, United Kingdom) following the manufacturer’s instructions. Serum FH levels were quantified by ELISA as described above. For MS analysis, the protein was reduced in loading buffer (BioRad, Munich, Germany) with 50 mM dithiothreitol for 5 minutes at 95°C and subsequently alkylated using iodacetamide at room temperature. SDS-PAGE was carried out on 4%–15% gradient SDS polyacrylamide gels (Mini-PROTEAN TGX; BioRad), and gels were stained with PageBlue (Thermo Fisher Scientific). Bands corresponding to FH and monitored by Western blot as described in Büttner-Mainik et al.38 were cut, and proteolytic digestion and extraction of peptides were carried out as described.62 Peptides were measured with an ESI-Q-TOF (Agilent 6250) coupled to a 1200 Agilent Nanoflow System via HPLC-Chip Cube Interface. An HPLC-Chip packed with Zorbax 300SB C-18 (Agilent 300A C18w ProtID-Chip/50[II]; analytic column: 75-μm inner diameter and 150-mm length; trapping column: 40 nl and 5-μm particle size) was used. Peptides were eluted with a linear acetonitrile gradient at a flow rate of 300 nl/min. MS/MS analysis was performed using data-dependent acquisition mode using three precursors for MS/MS (standard enhanced model; CID). Raw data analysis was performed using MassHunter Workstation version B.04.00 Build 4.0.479.9, Service Pack 2. Additional MS/MS analysis was done on an LTQ Orbitrap XL Mass Spectrometer (Thermo Fisher Scientific) as described.63 Raw data processing of all MS/MS data was performed using Mascot Distiller V2.5.1.0 (Matrix Science). Database searches were performed using Mascot Daemon V2.4 (Matrix Science) against a reverse concatenated P. patens database (version 1.6 protein models64) and the human FH sequence (Uniprot: P08603). Simultaneously, an in-house database containing sequences of known contaminants (e.g., human keratins and trypsin) was used. Glycopeptide identity was confirmed via inspection of the presence of the Gn-specific reporter ions on MS/MS spectra.65 The following search parameters were used for Q-TOF measurements: peptide mass tolerance, 50 ppm; MS/MS mass tolerance, 0.05 D; 13C, 0; enzyme, semitrypsin or no enzyme specification with maximal two missed cleavages; and variable modifications, Gln→pyroGlu (N-terminal Q) −17.026549 D, oxidation (M) +15.994915 D, Asn_deam_Asp −0.984016 D, Hydroxyproline (P) +15.994915 D, and carbamidomethyl (C) +57.021464 D as fixed modification. For the Orbitrap measurements, the same search parameters were used, with a peptide mass tolerance of 10 ppm and an MS/MS mass tolerance of 0.8 D. The Mascot searches of the Orbitrap measurements were filtered with Scaffold4 software (version 4.2.1; Proteome Software, Inc., Portland, OR) using the ProteinProphet and the PeptideProphet.66,67 The threshold was 99% ProteinProphet and 90% PeptideProphet and to at least two assigned peptides. The ability of FHmoss to interfere with C3b or soluble heparin was determined by ELISA as described before.21 For C3b ELISA, 1 μg purified C3b (Complement Technology) diluted in PBS (Gibco; Life Technologies, Darmstadt, Germany) was coated on Maxisorb Plates (Nunc; Thermo Fisher Scientific). Unspecific binding sites were blocked with 2% BSA (Thermo Scientific) in PBS for 2 hours at 37°C. For heparin ELISA, 5 μg heparin sodium salt (Sigma-Aldrich) was diluted in PBS and coated onto heparin-binding plates (BD Biosciences, Heidelberg, Germany). Wells were washed with assay buffer (20 mM HEPES, 130 mM NaCl, and 0.1% Tween20 [pH 7.3]), and unspecific binding sites were blocked with 1% BSA in assay buffer for 2 hours at 37°C. After washing, 125 ng FHmoss or the same volume of Δxt/ft extract, 125 ng FHplasma (Complement Technology), and PBS as control samples were incubated on C3b- or heparin-coated wells, respectively, in the appropriate assay buffer. Finally, wells were incubated using goat anti-human FH antibody (Complement Technology) followed by incubation with an HRP-conjugated rabbit anti-goat serum (Dako, Hamburg, Germany). After washing, TMB Substrate (eBioscience, Frankfurt, Germany) was added, and the OD at 450 nm was measured using a Synergy HT Microplate Reader (Bio-Tek, Bad Friedrichshall, Germany). HUVECs were cultivated after manufacturer’s instructions (PromoCell, Heidelberg, Germany). For flow cytometry, HUVECs were grown under serum-starved conditions for 24 hours. After blocking with 1% BSA in 0.5× PBS, cells were incubated with 10 μg FHplasma or FHmoss for 1 hour at 37°C. Control experiments were performed using the same volume of an identically processed purified extract from Δxt/ft or without recombinant protein. After washing, cells were stained using goat polyclonal FH-specific antibody (Complement Technology) after three washing steps and incubation using a rabbit anti-goat Alexa 488–labeled antibody (Invitrogen, Darmstadt, Germany). Finally, nonviable cells were counterstained using 7-amino-actinomycin D (Sigma-Aldrich), and viable cells were processed by flow cytometry using an FACS (FACSCalibur; Becton and Dickinson, Heidelberg, Germany) and Cyflogic analysis software. For binding experiments using immunofluorescence microscopy, HUVECs were grown as described above and plated onto fibronectin-coated (Sigma-Aldrich) coverslips (Langenbrink, Emmendingen, Germany). After fixation in 3% paraformaldehyde (Science Services) and blocking, cells were incubated with 10 μg FHmoss or the same volume of Δxt/ft extract. After washing, cell-bound FH was stained using a goat polyclonal FH-specific antibody in blocking buffer after intensive washing and incubation with a rabbit anti-goat Alexa 488–labeled antibody. Nuclear and membrane counterstaining was performed by using Hoechst 33342 (Sigma-Aldrich) and Alexa 633 conjugate of wheat germ agglutinin (Thermo Scientific). Cells were covered with PermaFluor Aqueous Mounting Medium (Thermo Scientific) on glass slides, and fluorescence staining was visualized with appropriate filters using an AX10 Microscope (Carl Zeiss GmbH, Jena, Germany) and Axiovision software. The complement regulatory activity of FHmoss was measured in a fluid-phase cofactor assay as described previously.68 Briefly, C3b and FI (Complement Technology) were incubated with FHmoss, FHplasma, or the same volume of Δxt/ft extract at 37°C for 30 minutes. The proteolytic cleavage of C3b catalyzed by FH and FI was analyzed by SDS-PAGE on 8% gels followed by Coomassie staining. The ability of FHmoss to displace Bb from the C3bBb convertase complex was measured by an ELISA adapted from McRae et al.69 and Eberhardt et al.70. In brief, purified C3b (2.5 μg/ml in PBS; Complement Technology) was immobilized on Maxisorb Plates, and the C3bBb complex was generated by adding 400 ng FB (Merck, Darmstadt, Germany) and 25 ng factor D (Merck) in phosphate buffer containing 2 mM nickel chloride, 25 mM sodium chloride, and 4% BSA. After incubation for 2 hours at 37°C and washing, FHplasma or FHmoss at various doses was added to the preformed convertase complex for 30 minutes at 37°C. FH-mediated dissociation of the convertase was monitored by determination of intact C3bBb complexes by measuring the amount of C3b-bound Bb detected by FB-specific antibodies (1:2000 in PBS and 0.1% BSA; Merck) followed by HRP-conjugated rabbit anti-goat (1:5000 in PBS and 0.1% BSA; Dako). After washing, TMB Substrate was added, and the OD at 450 nm was determined. Serum samples from healthy donors or patients with aHUS were collected using standard procedures. Briefly, a minimum of 5 ml whole blood was allowed to clot in serum tubes for 30 minutes at room temperature. After centrifugation, cellfree serum was immediately frozen at −80°C. Patient 1 is a 9-year-old girl with familiar aHUS carrying a previously described mutation in FH (R1215Q).71 Her disease manifested at the age of 14 months old. She has received eculizumab for 6 years. Serum samples were collected before treatment with eculizumab. Patient 2 is a 15-year-old boy with aHUS, which manifested in his first year of age. He shows a heterozygous C-terminal deletion of FH.72 He receives FFP every second week to substitute defective FH and has shown stable renal function over the last years without sign of active thrombotic microangiopathy events. Serum samples were collected before infusion of FFP. This study was approved by the Ethics Committee Freiburg, and written informed consent was provided for sample collection and subsequent analysis. The ability of FHmoss to inhibit the AP activity in human sera was determined by the Wieslab Complement System Alternative Pathway Enzyme ELISA Kit according to the manufacturer’s instructions (Euro-Diagnostica, Malmo, Sweden). Briefly, FHmoss or FHplasma was diluted in serum of a patient with aHUS and incubated in presence of AP-specific buffer in wells precoated with LPS. After washing, active C5b-9 formation was detected with alkaline phosphatase–conjugated mAb, recognizing the C9 neoantigen formed during C5b-9 assembly, followed by incubation with alkaline phosphatase substrate solution for 30 minutes. The amount of complement activity was calculated on the basis of the OD at 405 nm measured in a Synergy HT Microplate Reader. The hemolytic assay was performed to measure the ability of FHmoss to protect sE from serum-induced cell lysis as described before.30 FH-depleted serum was obtained from Complement Technology. Heat- nactivation of FHmoss was performed at 95°C for 30 minutes. Briefly, 5×107 freshly prepared sE (Fiebig, Idar-Oberstein, Germany) were diluted to a final volume of 25 μl in GVB/Mg2+ per EGTA buffer (Complement Technology). FH in varying amounts or controls were diluted to a final volume of 15 μl with GVB/Mg2+ per EGTA buffer, and 10 μl serum was added. Subsequently, the reaction mix was incubated at 37°C for 30 minutes and stopped by adding 200 μl GVB/EDTA buffer. After centrifugation, the OD of the supernatants was measured at 414 nm in a Synergy HT Microplate Reader, and corresponding blank values (without serum) were subtracted from each value. Ten-micrometer cryosections from mouse kidneys were cut on a Leica CM 3050S Cryostat, mounted on SuperFrost Plus Glass Slides (Langenbrink), and stored at −80°C. After fixation in 4% paraformaldehyde solution, sections were permeablized in PBS and 0.5% Tween 20, and C3 was detected using a goat anti-mouse C3 after a second rabbit anti-goat Alexa 488–conjugated antibody (Invitrogen). After washing, slides were mounted in VECTASHIELD HardSet Mounting Medium (Vectorlabs) and covered with glass coverslips. Sections were visualized using an AX10 Microscope (Carl Zeiss GmbH) and Axiovision software. For quantitative immunofluorescence staining, mean fluorescence intensity of three glomeruli per section was determined by using Image J Software (National Institutes of Health) and expressed in arbitrary fluorescence units. Data were analyzed using GraphPad Prism 5 (GraphPad Software, San Diego, CA). Groups were compared using one-way ANOVA with Bonferroni multiple comparisons test as indicated. R.R. is a founder of Greenovation Biotech GmbH (Freiburg, Germany) and currently serves on its advisory board. H.N., A.B., N.K., J.K., B.F., A.S., and T.F. are staff members of this company. Greenovation Biotech GmbH develops and markets moss-based biopharmaceuticals. We thank Dagmar Krischke, Astrid Wäldin, Karin Sutter, and Simone Holl for their support of this work; Prof. Dr. Matthew Pickering for providing the FH−/− mice; and the Center for Experimental Models and Transgenic Services for excellent animal care. We thank Dr. Joern Dengjel for the use of the LTQ Orbitrap XL setup and Anne Katrin Prowse for proofreading of the article. This work was supported by contract research Glykobiologie/Glykomik of Baden–Württemberg Stiftung P-BWS-Glyko/13 and Excellence Initiative of the German Federal and States Governments grant EXC294 (to R.R.). P.F.Z. acknowledges support from Collaborative Research Centre 1192 Immune-Mediated Glomerular Diseases funded by Deutsche Forschungsgemeinschaft Project B6 and has received funding from the European Community's Seventh Framework Programme under grant agreement no. 2012-305608, “European Consortium for High-Throughput Research in Rare Kidney Diseases (EURenOmics)”. The funders had no role in study design, data collection and analysis, decision to publish, or preparation of the manuscript. This article contains supplemental material online at http://jasn.asnjournals.org/lookup/suppl/doi:10.1681/ASN.2015070745/-/DCSupplemental.